Photos and maps to be posted at some point...! 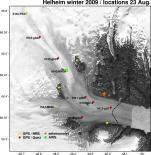 GPS networks and auxiliary geophysical instrumentation were installed at Helheim and Kangerdlugssuaq glaciers in East Greenland in late June and early July. The GPS networks are composed of a mix of telemetry-capable stations and locally recording stations. At Kangerdlugssuaq glacier, most of the stations are telemetering data by radio to a local base station, and those data are then retrieved via an Iridium satellite link (see below for network telemetry status). 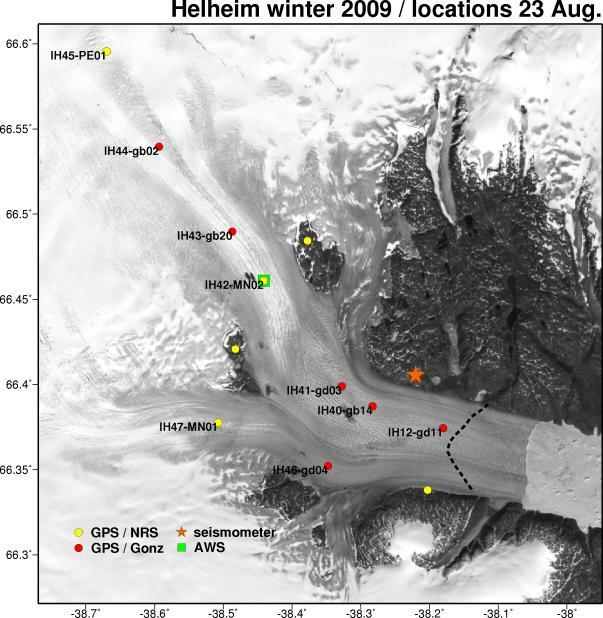 At Helheim glacier, the majority of the GPS stations also telemeter to a local base station via radio link, and a subset of those are currently available through the Iridium link (telemetry status to be added here in the future). The Helheim geophysical network also includes time-lapse cameras, tide gauges, and a seismic network. Update: The network at Kangerdlugssuaq was removed on August 27 after a successful season of data collection. 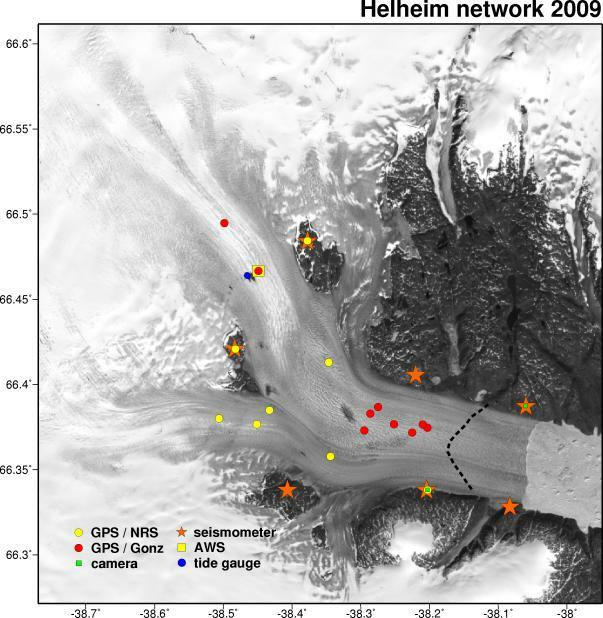 A reduced network remains in place at Helheim glacier. New maps coming soon! Many thanks to Unavco, especially Marianne Okal and Bjorn Johns, and IRIS-PASSCAL, especially Tim Parker, for engineering support. Thanks also to our helicopter pilots and mechanics, this season Janus Vilendal Petersen, Erling Wennevik, Peter Harrishøj, Andreas Hedström, Morten Jørgensen, and Per Houg. Project SERMI is a collaborative, international, interdisciplinary project aimed at understanding the dynamics of large outlet glaciers on earthquake to interannual timescales. The project focuses on East Greenland's two largest outlet glaciers: Helheim glacier and Kangerdlugssuaq glacier. We are working to integrate seismological, glaciological, and geodetic observations, collected in the field and via remote sensing, to build an understanding of flow dynamics and short-timescale glacier behavior. One important motivation for our work is to obtain an understanding of the mechanisms by which glacial earthquakes are generated, and of their relation to glaciological and climatological processes. This new class of earthquakes, of which more than 90% occur in Greenland, was identified in 2003 by Ekström et al. (2003). Little is understood about the mechanism by which glacial earthquakes occur. Recent work (Ekström et al., 2006) shows, however, that the number of glacial earthquakes that occur on Greenland is strongly seasonally modulated, with the largest number of events occurring during the late summer months; a rapid increase in the number of earthquakes at outlet glaciers across Greenland since approximately 2000 suggests a link to large-scale climate change. The SERMI research project consists of two main parts: (1) field deployments of Global Positioning System (GPS) stations on Helheim and Kangerdlugssuaq Glaciers, located in East Greenland, to obtain direct measurements of surface motion with high time resolution; and (2) integrated, interdisciplinary analysis of recorded GPS, seismic, and glaciological data using state-of-the-art techniques from each field to obtain an understanding of the mechanism by which glacial earthquakes and other short-time-scale flow variations occur. Seismic analyses of global and local seismic data provide estimates of earthquake source characteristics, while geodetic observations provide detailed information about the timing and pattern of deformation within the glacier. Auxiliary geophysical measurements (e.g., tide gauge, AWS, airborne mapping) provide information about environmental conditions at the glacier. Veitch, S. A., and M. Nettles, Spatial and temporal variations in Greenland glacial-earthquake activity, 1993-2010, J. Geophys. Res., doi:10.1029/2012JF002412, 2012. 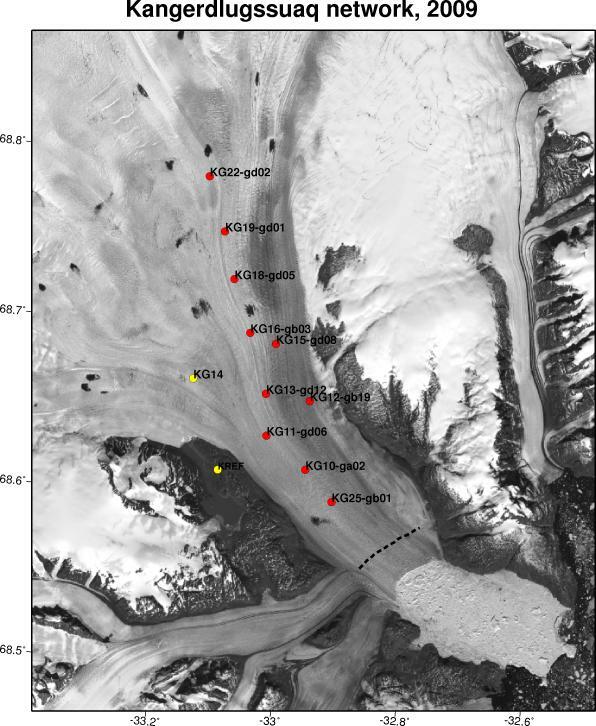 Andersen, M. L., M. Nettles, P. Elosegui, T. B. Larsen, G. S. Hamilton, and L. A. Stearns, Quantitative estimates of velocity sensitivity to surface melt variations at a large Greenland outlet glacier, J. Glaciol., 57, 609-620, doi:10.3189/002214311797409785, 2011. Andersen, M. L., T. B. Larsen, M. Nettles, P. Elosegui, D. van As, G. S. Hamilton, L. A. Stearns, J. L. Davis, A. P. Ahlstrøm, J. de Juan, G. Ekström, L. Stenseng, S. A. Khan, R. Forsberg, and D. Dahl-Jensen, Spatial and temporal melt variability at Helheim Glacier, East Greenland, and its effect on ice dynamics, J. Geophys. Res., 115, doi:10.1029/2010JF001760, 2010.
de Juan, J., P. Elosegui, M. Nettles, T. B. Larsen, J. L. Davis, G. S. Hamilton, L. A. Stearns, M. L. Andersen, G. Ekström, A. P. Ahlstrøm, L. Stenseng, S. A. Khan, and R. Forsberg, Sudden increase in tidal response linked to calving and acceleration at a large Greenland outlet glacier, Geophys. Res. Lett., 37, doi:10.1029/2010GL043289, 2010. Nettles, M., and G. Ekström, Glacial earthquakes in Greenland and Antarctica, Ann. Rev. Earth Plan. Sci, 38, 467-491, 2010. Nettles, M., T. B. Larsen, P. Elosegui, G. S. Hamilton, L. A. Stearns, A. P. Ahlstrøm, J. L. Davis, M. L. Andersen, J. de Juan, S. A. Khan, L. Stenseng, G. Ekström, and R. Forsberg, Step-wise changes in glacier flow speed coincide with calving and glacial earthquakes at Helheim Glacier, Greenland, Geophys. Res. Lett., doi:10.1029/2008GL036127, 2008. The SERMI project is supported by the Gary Comer Science and Education Foundation, the U.S. National Science Foundation (ARC-0612609, ARC-0713970/ 0710891/0713749), the Danish Commission for Scientific Research in Greenland (KVUG), the Spanish Ministry of Education and Science (CGL2005-25079-E, CGL2006-27121-E, POL2006-07076), NASA (NNG04GL69G, NNG04GK39G), the Geological Survey of Denmark and Greenland (GEUS), Geocenter Copenhagen, the Danish National Space Center, the Lamont-Doherty Climate Center, and the Dan and Betty Churchill Exploration Fund. Meredith Nettles, Lamont-Doherty Earth Observatory of Columbia University, copyright ©2006-2012, all rights reserved.